In a week from now, the ultimate European democracy Sweden holds national elections. All polls indicate after France (FN 20% in first round of Presidential elections 2017), Italy (Lega Nord 15% in 2018 elections), Hungary (Viktor Orban re-elected with 70% of the vote), Germany (the AfD took 14% in the 2017 election), the Netherlands (PVV second biggest party with 18% of the vote in 2017 election) and Austria (PM Kurz rules together with the right-wing Freedom Party), another major European member state will make a hard right turn. The Sweden Democrats of Mr. Jimmie Akesson look set to take some 20% of the vote on a purely anti-immigrant, anti-European program. University specialists of Swedish schools were asked to explain what went wrong in Sweden? Ms. Ann-Cathrine Jungar, a political professor at Södertörn University said that the Sweden Democrats had “basically an open field” as the only party critical of immigration and the only ones willing to discuss the issue. “And now the mainstream parties can’t get back the voters they’ve lost,” she explains. The Swedish economy is doing very fine and is humming along nicely. With unemployment at its lowest rate for a decade, the ruling political parties seemed unknowing of society’s problems. As the Swedes worried about immigration and crime, support for the Sweden Democrats’ policies, which include a total freeze on asylum seekers, accepting future refugees only from Sweden’s Nordic neighbors Denmark, Norway or Finland and tougher penalties for crime combined with added budgets for police forces, surged. 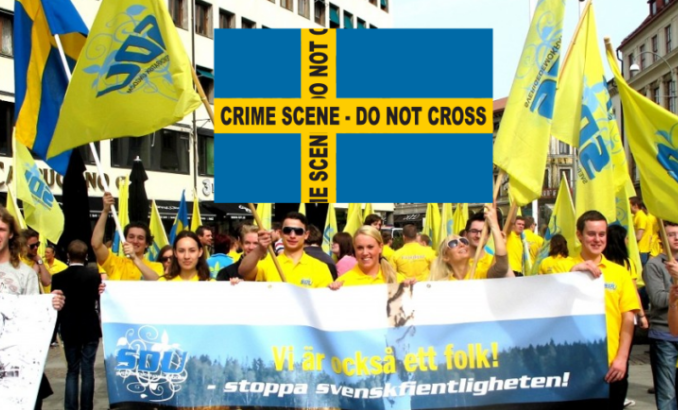 Related coverage: <a href="https://thegoldwater.com/news/35764-Sweden-Elections-PM-Party-Members-Caught-Spreading-Lies-About-Right-Wing-Rivals"> Sweden Elections – PM Party Members Caught Spreading Lies About Right-Wing Rivals</a>. However, Mr. Anders Sannerstadt who works as a political scientist at Lund University explained it best when stating that the “humanitarian superpower” Sweden seemed, has long been divided over asylum and immigration, but no one dared to say anything as it was not politically correct. Some 400,000 people, 163,000 in 2015 alone, have applied for asylum in Sweden in the past six years. This is the highest number per capita in Europe and helped tip the population over the 10 million mark last year. Immigrants from mostly Middle Eastern countries now make up 5% of the Swedish population. Sweden votes on 9 September. Doesnt take a genius to have figure this out. And our leaders are/were suppose to be among the brightest. Sad thing is that SA really isn't a shithole. The country has made unbelievable progress in the last few hundred years and the black are hellbent on destroying it. Interesting they are going after their food supply. Agreed, 35899, not very smart. After the whites are forced out, their clean water supply in metropolitin areas will evaporate. Food and water, really? It's what they deserve 35917! They should make sa all black and let them run it right into the ground. Then maybe this kind of thing won't happen again. Thing is we need to help those people get out of there. Those people are the kind of immigrants we can use in America! Send the rest of them to sa.